Add massage, body work, or energy work to your practice for some extra self care and as a great compliment to your asana practice. We offer 60 minute or 90 minutes sessions with optional add ons to be discussed with your massage therapist. Please review our policies prior to booking your treatment. Leave your shoes and stress at the door! By using both massage techniques and energy work, the session allows total cleansing and calming for mind, body, and soul. Focus on tight areas of the body with manipulation and deep stretching to create space within the body and increase your range of motion. You’ll work with your massage therapist to determine places in the body you’d like to receive extra attention. 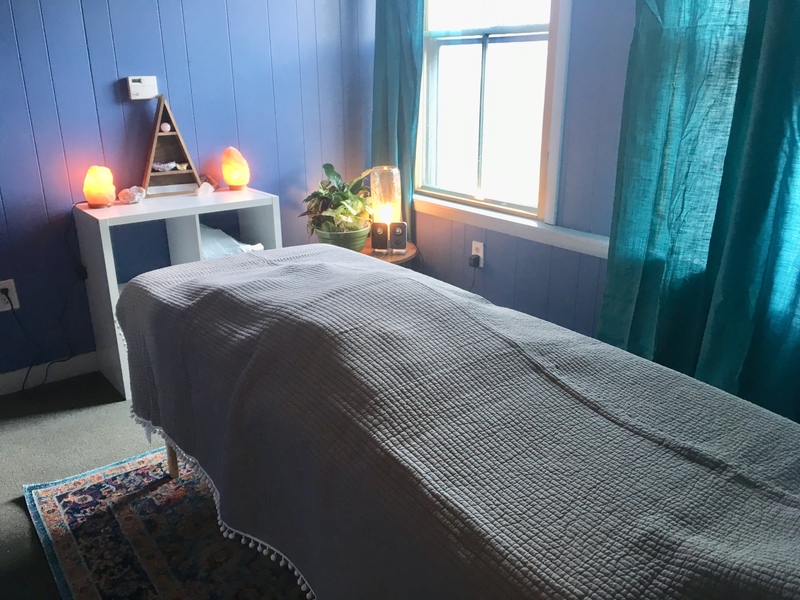 The intention of a reiki session is to transmit energy into the client, creating a platform of deep relaxation to help speed healing and decrease other symptoms one might be experiencing. Monthly members receive 10% off all body work appointments. Appointments are currently available Tuesday-Saturday. Please click “find an appointment” to request an appointment time. September made her move to Maine in 2005. She enjoys being outdoors with her dog, Lady and all the beauty Maine has to offer. She attended the Spa Tech Institute in 2013 for holistic massage therapy and her passion began there. Shes been trained in a variety of modalities including Swedish, myofascial, pregnancy, deep tissue and the energy work of polarity. She then continued her education and became certified in Reiki, Thai massage, Cupping & Scraping (gua sha). Each massage is tailored for her clients. The goal is for you to not only leave with muscle release but for the mind to feel clear & replenished. You can book an appointment online through mindbody, in person, or by emailing info@samudrastudioyoga.com. We check our email twice a day. A credit card is required to book your appointment. You can cancel up to 24 hours before your appointment without charge. Appointments cancelled after 24 hours before the scheduled appointment will be charged 50% of the original appointment cost. All other cancellations, including no-shows will be charged to the credit card at full price of the original booking.